Steamed egg is something I used to associate with bland school lunches at my bushi-ban in Taiwan. It never looked very appealing and was consistently bland. It was not until a friend took me for dinner to a very attractive Japanese restaurant in downtown Hsinchu that I appreciated the dish. In between gossiping about her husband and my boss she ordered me a serving of steamed egg. I was a bit apprehensive I have to admit, but when the waitress placed the dish in front of me I knew it was going to be far superior to any other steamed egg dish I’ve ever had before. The color was a lovely pale yellow, with a silky texture, like perfect soft tofu. It tasted supreme. I have since attempted to recreate this perfect steamed egg dish several times, but sadly my efforts have not come near the one I had that day. So instead of trying for a perfect and simple variety I started experimenting with adding some additional ingredients to create a small breakfast or lunch, resulting in this, my tuna steamed egg. Bring some water to a gentle simmer in a pot and cover with a steamer. While the water is coming to a simmer, mix the eggs, soy, oil, water, spring onion, chili and white pepper in a bowl. Divide the tuna between two ramekins or heat proof cups and pour the egg mixture evenly over the tuna. Lightly mix the two together, place in the steamer and cover, allowing it to steam for about 15 minutes, or until a fork inserted comes out clean. Enjoy as is or serve with some fingers of toasted bread, dipping the bread in the steamed egg. The fun thing about steamed egg is that the varieties are almost limitless. Instead of tuna, try bits of fried bacon, or strips of shredded chicken, or slices of plum tomatoes. Use some white wine instead of water, olive oil instead of sesame and so forth. have fun and do share your attempts! The past couple of Friday nights we’ve headed over to Alexander’s sister and husband’s place for dinner and movies or games, making pizzas, spring rolls, satay and other fun dinners. We always end up spending the night and having breakfast the next morning before moving onto a new project like baking cake or attempting doughnuts. Last weekend I tried a new way of making french toast after paging through the latest issue of Cook’s’ Illustrated. For this Saturday morning’s breakfast I decided to steer away from looking for a recipe, but rather look at the visually stunning Simply Breakfast (I’m sure most of you are familiar with this sight) for inspiration. The first picture I saw was the one that stuck with me while I was looking over her pages. 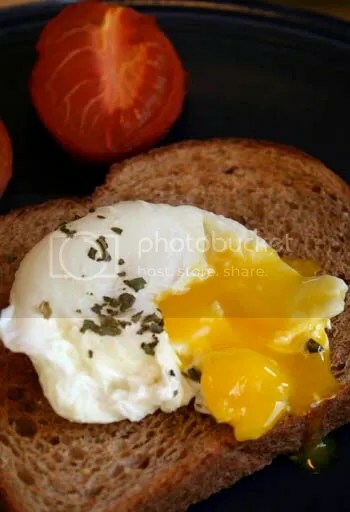 A lovely poached egg, served on a slice of toast. See the picture below. And so I decided to make poached eggs for breakfasts for the first time in my life. With the help of Julia Child. Alexander’s been reading about her a lot recently, and as his dad has several of her books on his shelves I decided to make use of her expertise. The recipe I used was from Mastering the Art of French Cooking Volume One and it made the process go smoothly. Even I was impressed. 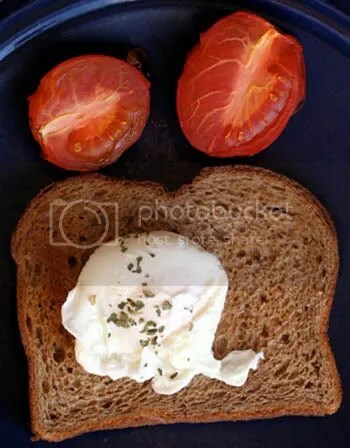 I served the eggs one slices of multigrain toast with oven baked roma tomatoes on the side. It was the perfect breakfast to start the weekend as well as our week of breakfast. More about that later.